One of my best girlfriends just got pregnant for the first time and asked me, "What is my one baby must-have"? 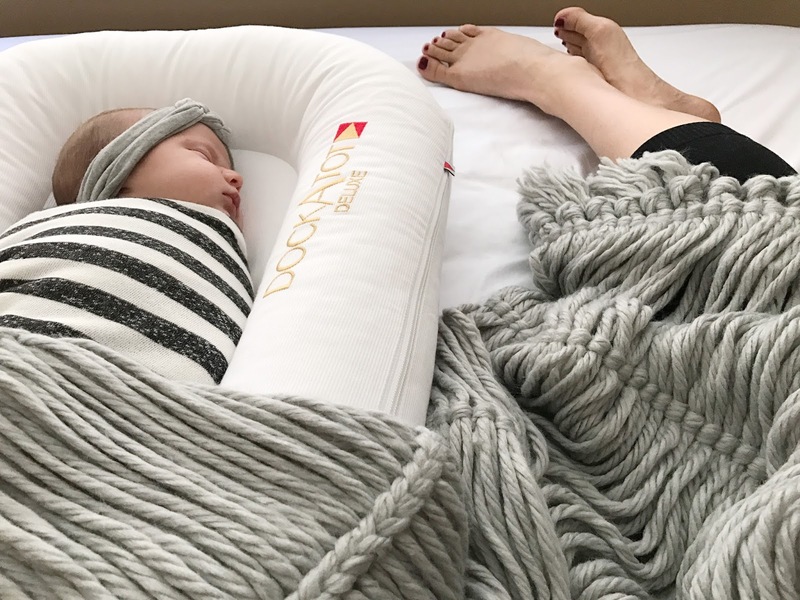 I've never answered a question faster in my life--MY DOCKATOT! It's a must have. A true life-saver! I've always been a little worried about co-sleeping with my newborns until I was introduced to this awesome product. My husband and I are pretty hard sleepers and it is way too scary for me to have my newborn in our bed. I always wake up panicked and check if they are breathing and I just worry a lot about it. Well, that is until we tried out the DockAtot. I really don't have to worry anymore! My new baby girl Monroe is about 4 weeks old now and I have no doubts it makes her feel safe & comfortable with those bumpers holding her in. We sometimes swaddle her and place her in it and we sometimes just let her arms and legs hang out. She doesn't really have a preference:) I have been sleeping better now with my newborn than I did with my 2 younger boys when they were her age. I owe it to the DockAtot and that my baby gets to sleep so close to me! If you're not into the whole-co-sleeping thing, that's ok! It can also be used for a changing pad, bonding, bed transitioning, tummy time, lounging, resting, playing, cuddling, etc. Really anything you want. Even for going on a picnic or to the beach. I plan on taking mine there this summer! Another big reason I love it is my boys know they can mess with her when she is in her DockAtot. I call it her "special bed" and they know they can't bug her when she's in there. I've even let my youngest son sleep next to her because I felt comfortable enough that she would be safe next to him! Oh, I just love it! I'm so grateful for this product and it truly has been a lifesaver for us. I've had so many struggles this pregnancy and delivery, but I haven't had to struggle with the sleeping as much this time around! Thank youuuuuuuu!